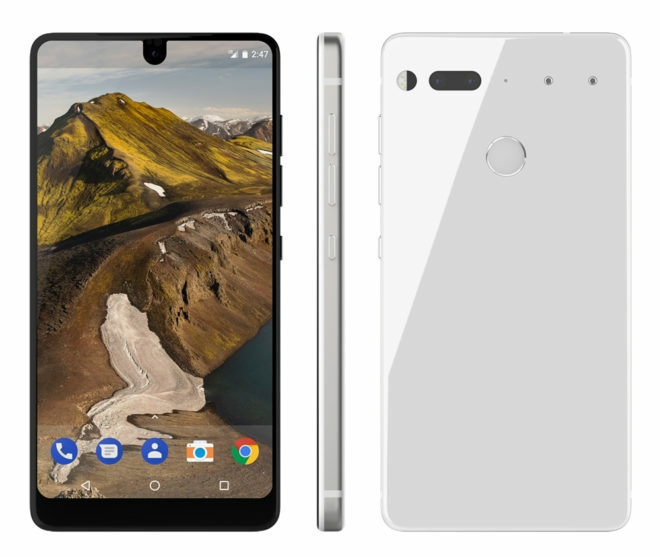 ORIGINAL: Meet the Essential Phone, the latest Android smartphone to enter the flagship market. 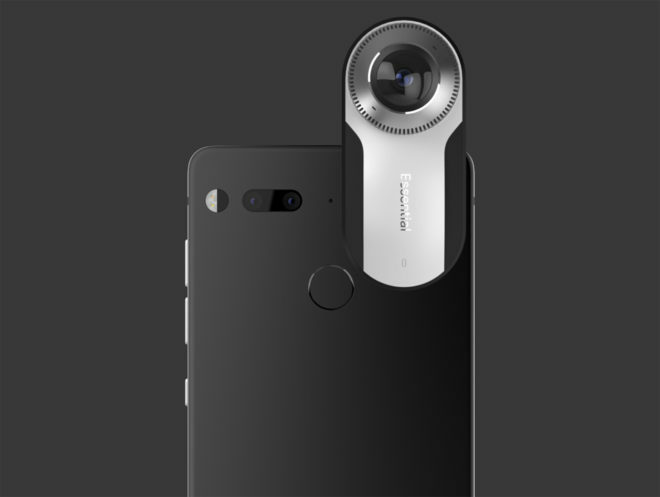 The Essential Phone is being made by Essential, a new company that’s being headed up by Andy Rubin, one of the co-founders of Android. Essential’s new phone comes with Android 7.1.1 Nougat. Also included with the Essential Phone is a 5.7-inch 2560×1312 display with rounded corners and a 19:10 aspect ratio. The screen has slim bezels on three of its sides, and at the top of the screen there’s an 8-megapixel camera that supports 4K video capture. That camera actually covers part of the top of the display, presumably in order to help keep its bezels slim. The back of the Essential Phone is home two a pair of 13-megapixel cameras, one color and one monochrome. This helps the Essential Phone to capture 200 percent more light than standard smartphone cameras, claims Essential, as well as improve low light performance. Also on the back of the phone is a fingerprint reader and a set of pogo pins that’ll be used for adding accessories to the Essential Phone, like a 360-degree camera and a charging dock. 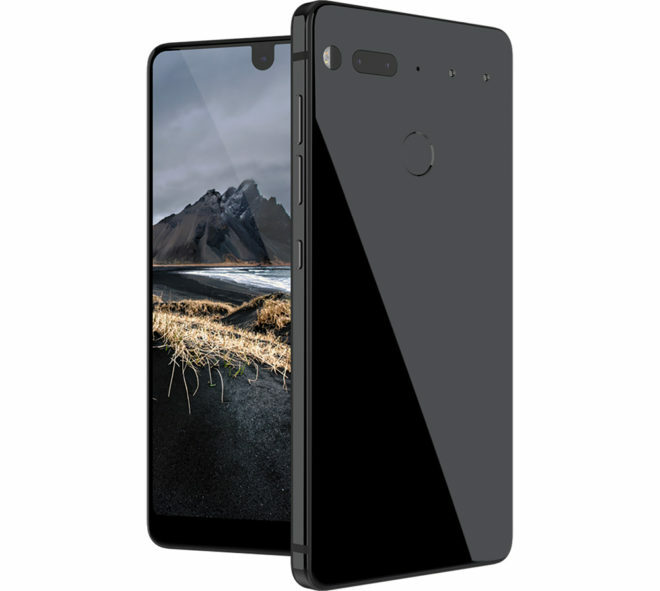 Other features of the Essential Phone include a Snapdragon 835 processor, 4GB of RAM, 128GB of storage, a 3040mAh battery, USB Type-C, fast charging, NFC, and body with a titanium frame, ceramic back, and Gorilla Glass 5 front. Also of note is that while the Essential Phone doesn’t include a 3.5mm headphone jack, Essential will include a USB Type-C-to-3.5mm adapter in the phone’s box. Essential says that unlocked phones bought on its site “will work with any carrier”, and the company adds that its phone supports Carrier Aggregation. T-Mobile’s LTE bands are supported by the device, but it’s unclear if the Essential Phone will be certified to work with features like T-Mobile VoLTE or 256 QAM. Essential is now taking reservations for the Essential Phone, but the only release info that’s currently available is “later this summer”. Essential will not charge your credit card if you reserve a model, though. When your phone is ready to be shipped, Essential will request your credit card info, and then your phone will ship when your card is charged. Pricing for the Essential Phone will be set at $699, and its 360-degree camera add-on will cost $199. For a limited time, though, you can add the 360-degree camera to your reservation for $749. The Essential Phone looks like a nice device, boasting an attractive and clean design (though that front-facing camera placement looks a little strange at first) and a flagship-tier spec list. However, there’s no word yet on any carriers selling the Essential Phone in their stores, and that’s how most US consumers buy their smartphones. Andy Rubin is a big name to us mobile fans, but he and Essential are relatively unknown to the public, so it’ll be interesting to see how well the Essential Phone sells. Essential today also introduced a competitor to the Amazon Echo and Google Home. Called the Essential Home, the device is an assistant that can answer questions, control smart home products, and give you proactive info, like telling you to leave early for a meeting due to traffic. The Essential Home runs Ambient OS and works with Alexa, Siri, and Google Assistant. There’s no word on when the Essential Home will launch or how much it’ll cost when it does. So what do you think of Essential’s new devices? Are you thinking about reserving an Essential Phone? I like it. Durability and small bezels. It though you could only have one or the other until now. I like the phone but the price seems a bit high. When you buy Apple or Samsung part of the cost is for the brand, this company doesn’t have one yet. Nah, 4GB is fine for this year’s flagship phones. The nitpicking for this phone would be battery, SD card, front camera in the screen, lack of waterproofing, and headphone jack. This isn’t that bad a price considering the 128gb storage and titanium body. It’s definitely not a budget phone but it’s cheaper than some very popular options that are in theory sub-par in design quality. What did you have that’s larger than an extended 5.7? This one’s 5.71, my last 3 were 5.75, 5.75, 6..
Should have gone for that 7″+ a few years back. My only complaint is the battery. I can live without an SD card on a 128GB phone and I could probably learn to live without the headphone jack. You probably will see other devices offer similar specs at a cheaper price, namely the OnePlus 5 and ZTE Axon successor. The key word is “similar.” .2 or .3 inches isn’t a big deal if the resolution of a screen is QHD. Both the ZTE Axon and OnePlus 3T offered NFC. ZTE offers a SD slot, so storage isn’t an issue. If one of them don’t offer Band 30, it’s not the end of the world. And to piggyback on Acdc1a, dual sim, some site reported that it’s the fastest charging phone in the world, 360 camera etc., etc. At that pricepoint it’s the best in the world, nothing else even comes close. This isn’t the G6 this phone has the latest processor, 128 GB of storage , and a great display. Essential has a chance to take LG market share down the road. Micro SD card yes or no? That’s a tipping point for me to spend that much on a device. gsmarena reports dual sim BUT not for storage. Don’t think so with the 128 internal. The camera attachment kind of reminds me of the one that worked on earliest Sidekick/Hiphip he and his team did. I was hoping he would make another Sidekick/Hiptop. Maybe in the future? Sounds nice, if it had a stylus I’d change my name to essential freud and pick one up. i hope noone purchases this phone. this crap needs to stop.. Anyone who does no 3.5 jack should balance out with a removable battery. Somebody tell Andy Rubin it’s not 2012 anymore. Nobody is coughing up $700 for phones when you can get decent phones for under $400. Tell that to Samsung. I agree with you about good phones under $400, but to say no one is spending $700 is just silly. Yeah… I’ve paid $700 for my last 3 phones, I believe? Not counting the One Plus One. The S8 is outpacing the S7 in some parts of the world at this point in time vs last year. People buy premium LGs, HTCs, Sonys, iPhones, Google Pixels, etc. This will probably have the same destiny that Amazon Fire phone had. Wait 6 months then will be less than $400! This company is the next hit. You sound like the People that said the G1 was Ugly compared to the iphone. Android owes its existence to T-Mobile. hundreds of millions of people are, so. I’ll take the HTC U11 over this. Unless there’s independent confirmation from TMo to the contrary…pass. Every single independent source cites VoLTE. Wi-Fi calling is a mystery, but if it’s truly running stock Android with no funny business it will support it. Essential on twitter said WiFi calling is present. VoLTE should be obviously present. But the device is lacking in comparison to the Galaxy s8. Samsung’s UI just doesn’t cut it for me. I have a Galaxy S7 Edge that I picked up from Mywit for a song and I still use my Nexus 6 as my daily driver. Wi-Fi calling on my S8 was absolute garbage, and I require it where I live no matter the carrier. It’s also not an android problem because my keyOne has zero issue’s on wifi calling. it’s nice but compared to phones on T-mobile with eip instead of total upfront…. How about less BYOD, and more JOD? They did the same thing to Google, pulling the Nexus phones after only a few months, and refusing to sell the Pixel entirely. Wish there was a 5.0 size phone. 5.7 to me is to big to carry all day in your pocket. It’s not as big as you think, remember the display is measured diagonally and when it goes edge to edge it’s probably the equivalent of something very similar or slightly bigger than the 5.0 you want. They say it’s 5% wider than a regular iPhone 7 which has a 4.7 inch display. so they carry this phone and not the U11? Wow.